The Electric Vegetable Steamer - Quick, Easy, & Healthy Cooking! The Electric Vegetable Steamer - Quick, Easy, Healthy Meals! The electric vegetable steamer is one of the most useful inventions in history, (if you ask me!) So why am I writing a page about vegetable steamers ? Because steamed vegetables are a healthy, tasty, and most important EASY way to prepare vegetables. Don’t laugh when I say this, but if you are the typical guy like me, you want food preparation to be fast, easy, and brainless. I do far too much thinking elsewhere to challenge my brain in the preparation of my meals. I suspect that you probably feel the same way. This is why I would recommend that you invest in one of these low cost machines, and when you do you will thank me for it. In fact, it will likely change the way you think about eating. I want to give you some tips to make healthy eating easier and more convenient starting with this one. This item is surely one of the greatest ways technology has made life easier. Ok, maybe I am exaggerating, but vegetable steamers that are this simple and reliable are a wonderful thing. Let me tell you what to look for and where to get it. You are looking for an electric model that is what I call a stand-alone. This means that it isn’t just some pot you place on your kitchen stove, but a freestanding unit that does everything itself. These things are not all that expensive either, a real bargain for the money. When making your choice, what I suggest you do is to do some searches on the net and compare product reviews that you find online. Amazon is a good place to do this, and you can read the feedback real people left on the site after they bought these products. Amazon has this rated 4.5 stars after 121 customer reviews. Pretty impressive for an inexpensive electric vegetable steamer! Note: I use this vegetable streamer pretty much every day, and after 5 years it's still going strong, and works perfectly every time! That’s it. Quick, brainless, and painless! Just the way I like it. The electric vegetable steamer works flawlessly every time. It even has a safety mechanism, so if by chance you forget to put the water in, it beeps and will not start. Yes, if you must know I did forget the water once or twice…. The amount of time it takes vegetable steamers to cook each type of vegetable or other food depends on the food itself and how YOU like it done. There are some simple guidelines printed right on the unit and complete instructions that come with it, so it is a very short learning curve. As I mentioned to you some time ago, the way your food is cooked makes a big difference in the nutrient content, and how healthy it is for you. Certain practices such as browning, char-broiling, frying, and micro waving are not healthy because of the way they alter the structure of the food. If we could eat our food raw, that would be ideal. However from a standpoint of safety, not to mention taste, cooking provides certain benefits that outweigh the drawbacks. Steaming is one of the healthiest ways to prepare food and an electric vegetable steamer is the easiest way to do it. Steamed vegetables are but one of the things you can do with this method of food processing. 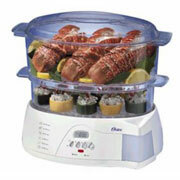 You can prepare a variety of foods including meats, chicken, fish, and shellfish in vegetable steamers. They are very versatile. The only thing you will want to remember is not to steam the food for too long, especially vegetables as they will lose nutrients if you overdo the steaming process. Also, be careful as you remove the cover, as the steam is VERY hot. Just be cautious and you will have no problems. In closing, let me just say that this is one of those instances where something that is cheap, fast and easy, is also good for you. Believe me when I tell you that an electric vegetable steamer and steamed vegetables will be a valuable addition to your healthy lifestyle.